Then I actually had the baby and thought …. No. NOW I’ve never needed a glass of wine more in my life! 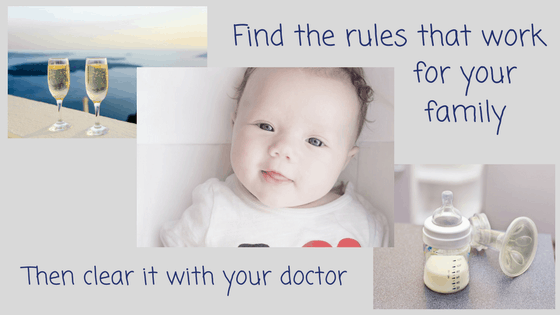 Here’s the point – if you are nursing your precious angel from heaven, you of course worry about doing anything that could possibly harm your baby. We all do! 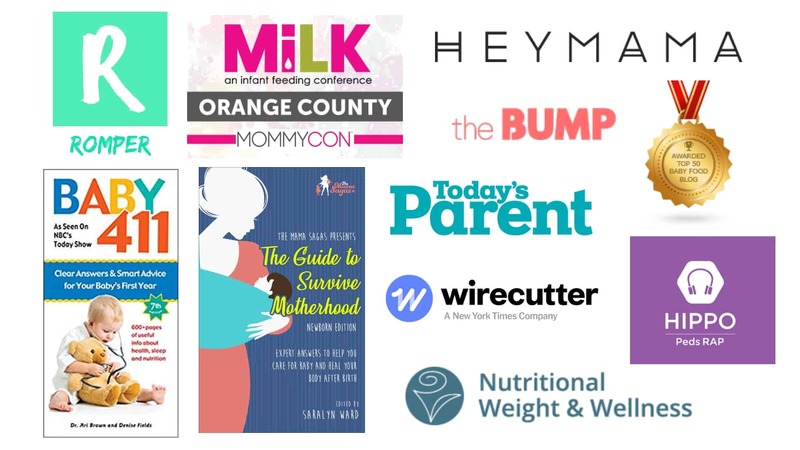 Lots of Moms worry so much about alcohol getting into their breast milk that they choose to avoid alcohol altogether for the duration of their breastfeeding journey. If that makes you happy – then do it!! But, I find that lots of Moms make this decision from a place of fear. And that is never the right place from which to make a decision. I’m here to provide you with all the nerd biological facts so you and your doctor can make an informed decision that’s right for your family. Whatever you do decide – you need to clear it with your doctor. 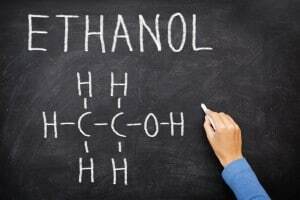 For my fellow chemistry nerds out there – you know that alcohol is chemically ethanol, and has an –OH moiety on the end of the molecule allowing it to pass freely through membranes. (If you don’t know that that means, you are probably cooler than I am – and don’t worry about it). This means that alcohol enters the bloodstream rapidly. 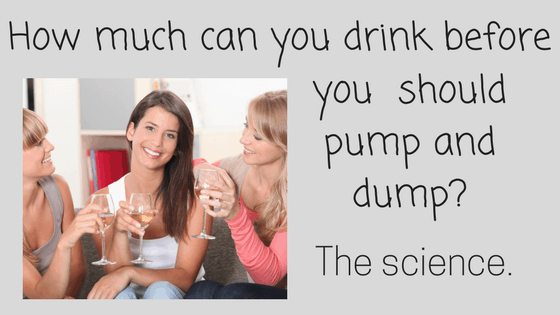 We know this because you start to feel buzzed pretty quickly after drinking alcohol. For a breastfeeding Mom, alcohol also passes freely across the mammary epithelial cells both INTO and OUT OF her breast milk. This transfer will be concentration driven. Translation: The alcohol content of her breast milk will be the same as the alcohol content of her blood, in real-time. The alcohol in the milk in her breasts will increase in real-time as she consumes more, and will decrease as her liver processes the alcohol and she starts to “sober up”. Alcohol consumption may decrease breast milk production while your body is still processing the alcohol (1). This is because alcohol affects affects both oxytocin and prolactin concentrations (the 2 master hormones that control breastmilk production). The affect is complicated and not completely understood, but the general consensus (from real old research) is that alcohol consumption results in reduced letdown/milk ejection, which probably explains the lower production (2-5). However, this effect is really variable between women, and seems limited to the time of alcohol consumption. The legal limit for driving is a BAC of 0.08%. I consider this very intoxicated, especially for a woman who just came off of 9 months of pregnant sobriety. A 160 pound woman who drinks 2 glasses of wine in 1 hour has a BAC of roughly 0.040%. So, for the 140 pound woman – If she nurses her baby 1 hour after 2 drinks, her baby drinks milk that has 0.048% alcohol in it. That’s 10 times lower than the amount of alcohol naturally in orange juice! So, the alcohol exposure to the breastfed baby is super minimal. 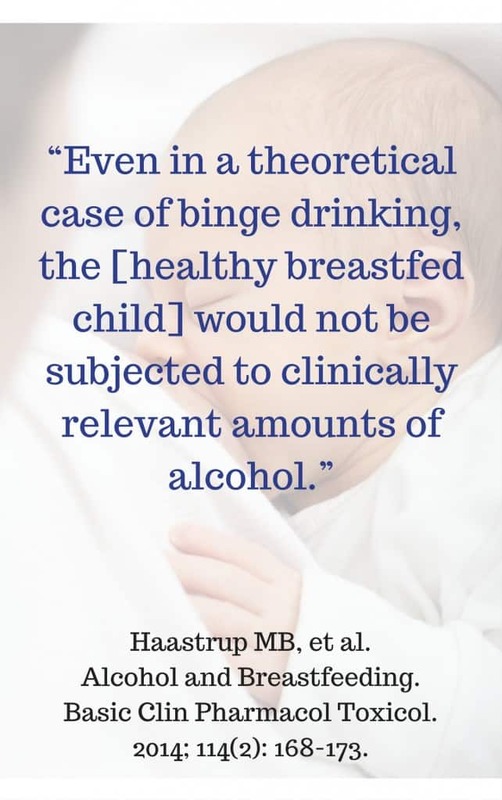 In fact, a nice short review on the topic stated that, “Even in a theoretical case of binge drinking, the [child] would not be subjected to clinically relevant amounts of alcohol.” (6). That certainly made me feel better! Now, before you rush for a glass of Pinot – it’s important to note that newborn babies’ livers are immature, so they don’t process alcohol as quickly as adults’. In fact, they process at about half the rate. So, even though the exposure seems trivial, it’s higher for infants than adults. However, at a responsible consumption rate for mothers, this is not considered a risk to healthy infants. There have been some studies of infant effects of consuming breast milk with alcohol in it. To be honest, the results are (to me) so minor and conflicting that I don’t want to list them all here (6). The funniest to me is that – when offered “sober” breast milk, and breast milk pumped after Mom had had a few (referred to as “happy milk” in my house) – the babies actually preferred the “happy milk”! (7). Hilarious. Another super recent study looked at infant outcomes and compared breastfed babies whose mothers did and did not drink. They reported that alcohol consumption was unrelated to breastfeeding duration (phew!) (8). They only found one difference in infant outcomes between groups – The infants whose mothers consumed alcohol at 8 weeks actually scored higher for personal-social development at 12 months (8). Now that doesn’t mean that drinking made the infants do better. There are a LOT of complexities that go into interpreting an observational study like this. But it certainly does make me feel better that the alcohol group was certainly not worse off. All the research (which is limited) has been done with healthy term infants, so that’s the only scenario this information applies to. If your baby is at all ill, or may have an even more immature liver – due to prematurity, illness, or any abnormality – that is a completely different story, and you’ve got to talk to your doctor. Since alcohol leaves the breast milk as quickly as it enters, we can take advantage of timing to even further minimize any infant exposure. Your BAC (and thus your milk alcohol) is highest 30 – 90 after drinking. So, time your nursing sessions accordingly. For example, my boys were/are both “all business” nursers – our average breastfeeding session is 10-15 minutes total (don’t hate – I’m just lucky!). Thus, my favorite time to drink was during nursing! This way they were exposed to very minimal alcohol and then I had at least 3 hours before their next feed, which is plenty of time to process 1 glass of wine. Take into account your baby’s average nursing time, and normal feeding schedule to time your drinking so that you are nursing when your BAC (and thus milk alcohol) are likely to be lowest. I (the Mama) never drink alone when I am the sole care-giver. Let’s be honest, never drinking alone is probably a good rule for everyone. We have a designated “care-giver” so that there is always someone who can drive, and walk around safely with the baby if he is fussy (it’s like having a DD for parenthood). NO CO-SLEEPING! I really mean it. Even if this is your normal sleeping arrangement. Please don’t bring the baby into the bed at all if you have had any alcohol. It’s just not worth the risk. These rules made me feel even better about being able to indulge every now and then without guilt (and without pumping-and-dumping – which is just so painful)! You know yourself best. Find rules that work for your own family within your own limits. Then clear it with your doctor. 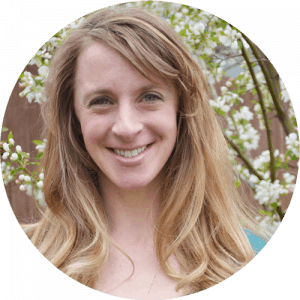 Motherhood today is high-pressure and hard! 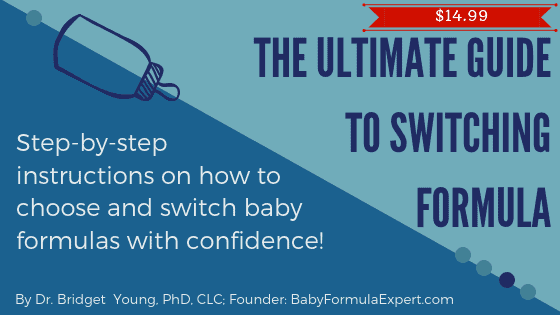 Taking a moment to enjoy and care for yourself is actually helpful to your baby – because it allows the best version of you to show up to motherhood. I hope that enjoying an occasional and responsible glass of wine, ideally with good friends, helps give you the perspective you need. You are doing a great job! Mennella JA. Short-term effects of maternal alcohol consumption on lactational performance. Alcohol Clin Exp Res. 1998;22(7):1389-92. Chien YC, Huang YJ, Hsu CS, Chao JC, Liu JF. Maternal lactation characteristics after consumption of an alcoholic soup during the postpartum ‘doing-the-month’ ritual. Public Health Nutr. 2009;12(3):382-8. Cobo E. Effect of different doses of ethanol on the milk-ejecting reflex in lactating women. Am J Obstet Gynecol. 1973;115(6):817-21. Cobo E, Quintero CA. Milk-ejecting and antidiuretic activities under neurohypophyseal inhibition with alcohol and water overload. Am J Obstet Gynecol. 1969;105(6):877-87. Mennella JA, Pepino MY, Teff KL. Acute alcohol consumption disrupts the hormonal milieu of lactating women. J Clin Endocrinol Metab. 2005;90(4):1979-85. Haastrup MB, Pottegard A, Damkier P. Alcohol and breastfeeding. Basic Clin Pharmacol Toxicol. 2014;114(2):168-73. Mennella JA. Infants’ suckling responses to the flavor of alcohol in mothers’ milk. Alcohol Clin Exp Res. 1997;21(4):581-5. Tay RY, Wilson J, McCormack C, Allsop S, Najman JM, Burns L, et al. Alcohol consumption by breastfeeding mothers: Frequency, correlates and infant outcomes. Drug Alcohol Rev. 2017. I appreciate this post more than I can say. I know my baby is comforted by my breast, even after a glass of wine. I also know of the science behind what you just so simply explained. Combining those two things into a conversation with my husband about why I’m ok to feed our son after having a glass of wine with dinner was a totally different situation. (Although he is an engineer and a whiz at anything related to mathematics). He understood with absolute clarity by the way you deliver this information! I don’t have the science brain that he does, so I couldn’t relay the info I had gathered on my own in a way that made any sense to him. He never thought I would put our little guy at risk, but I know he doubted his son’s safety while respecting my decision on the subject. We are now on the same page and can enjoy our shared love of wine with dinner again without worry or me feeling doubted. Thank you! This warms my heart so much – mostly because my hubby is an engineer too …. so I feel ya girl! I am thrilled you guys can be on the same page now – that is SO important when it comes to these big decisions. cheers! Hello Dr Young. What an interesting read. I happen to work in a lab and am constantly breathing in alcohol or some other kind of chemical. I was wondering if this ends up in my breastmilk just through breathing. Thank you for such clearly stated and detailed information! I do have a question though. Even when I follow these guidelines and pump my milk a few hours after a drink or two, my milk still SMELLS like the booze I had (if I had wine, it smells like wine, beer: smells like beer.) Especially after being refrigerated. Any thoughts or suggestions on this? Hi Julie, I DO Have a thought. I am not a food scientist, but I know that compounds that impart smell and flavor pass through breast milk. There’s research showing how breast milk will smell like garlic after Mom eats a garlicy meal. This is one of the ways breastfed babies get to experience their cultural diet’s flavors before they are eating solid foods. The chemical compounds that elicit a “smell” are different than ethanol (alcohol). So, it seems possible to me that the smell could remain after the alochol has left. The timing is what will have the effect on the alcohol concentration in the milk.